In 2013, Starbucks committed to hiring 10,000 Veterans and Military spouses by November, 2018. In March, 2017 we reached that goal and pledge to increase that number to 25,000 by 2025. Our commitment extends beyond hiring as we plan to dedicate 100 more Military Family Stores across the U.S. by 2022. It also includes expanded benefits, establishing places for our veteran and military family community to connect with one another, creating volunteer opportunities in their communities and leveraging their unique leadership experience to positively shape our company and our world. Veterans and military spouses play a vital role in strengthening communities through leadership, service and active civic engagement. Veterans are more likely to vote, volunteer, give to charity and contact public officials as compared to their nonmilitary counterpart. Our goal is to be the leading corporate advocate and voice for transitioning veterans, military spouses and military families. Through partnerships with like-minded companies, military and veteran service organizations, we strive to bridge the divide between the 1% of Americans who have served in the U.S. military and the 99% who have not. Starbucks has partnered with "Team Red, White and Blue," "Team Rubicon" and "The Mission Continues" as a way for more people to honor and serve with veterans and military spouses. Our 32 (and counting) Starbucks Military Family Stores is a place where our veteran community can work, unwind and connect. These stores (and others) host Military Mondays where local Veteran Service Organizations provide transition guidance and information. The Starbucks Armed Forces Network (AFN) on Facebook is open to all partners and advocates who want to support our military partners and their families. AFNs mission is to help veterans transition to civilian employment and give all partners the opportunity to strengthen connections while supporting a culture that embraces our military partners and their families. At Starbucks, veterans, military spouses and civilians work together every day—and it’s changing our perspectives and our company for the better. Honor, duty, service. 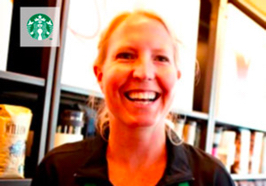 Your military background makes you a natural fit for a career at Starbucks. We are team-focused, and are bound by our shared values for creating a special experience for our customers and partners. The leadership skills and work ethic of our veterans and their spouses are exactly what we look for in new partners (employees), and are invaluable to success of our business. We encourage veterans and their spouses to explore career opportunities and unique benefits like our Starbucks College Achievement Plan. For those in the National Guard or Reserves, we offer up to 80 hours of pay each year when service obligations take you away from work. In a first of its kind collaboration with Arizona State University (ASU), we’re offering all part- and full-time benefits eligible U.S. partners full tuition coverage for every year of college to earn a bachelor’s degree. Partners receive support from a dedicated team of coaches and advisors, 24/7 tutoring on a variety of subjects, and a choice of more than 60 undergraduate degrees through ASU's research driven and top-ranked program, delivered online. Introducing: our new Pathway to Admission program, launched February 7th, 2017. Now, eligible partners who do not have a college degree or who did not already gain admission to ASU can get the personalized help they need to reach their goals by filling in gaps in their academic history by completing up to 10 freshmen-level courses, as many times as they want, tuition-free. At Starbucks, our Total Pay package is called "Your Special Blend." It’s a benefits package that is tailored to the needs of our partners. And it’s designed just for you. Benefits-eligible partners (those working 20 or more hours a week) can get a wide range of perks, benefits and assistance. Your Special Blend might include bonuses, 401(k) matching and discounted stock purchase options. We offer adoption assistance and health coverage for you and your dependents, including domestic partners. Starbucks College Achievement Plan is an opportunity for all benefits eligible U.S. partners (all brands) to complete a bachelor’s degree with full-tuition coverage for every year of college through Arizona State University’s top-ranked degree programs, delivered online. In addition, to show our gratitude for our partners who are military service members and veterans, they may extend an additional SCAP benefit to their spouse or child. Partners also appreciate our recognition programs, career sabbaticals and other time-off programs. Plus, you can take advantage of partner perks such as 30% in-store and online discounts, one free pound of coffee, box of K-Cup® Packs or tea a week.